Visit of the Cathedral and its terraces! The Cathedral and its Rooftops. 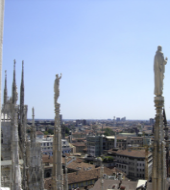 After admiring the Cathedral of Milan and discovered its history with an expert guide, you will have the unique and unforgettable experience of visiting the rooftops of the church. Be enchanted by the breathtaking landscapes and enjoy the opportunity of seeing the pinnacles and sculptures so close up. You will reach the first terrace with the elevator and from there you will continue climbing the last 82 steps leading to the highest terrace, saving a total of 250 steps! Guide service, an entry ticket for the Duomo and Terraces, headphones. During hot days wear a hat to protect yourself from the sun. On the terraces of the Cathedral, there are no toilet facilities or bars, bring water. The elevator has a maximum capacity of 8 pax, so you might have to wait few minutes before climbing up. The staircase to reach the highest terrace is particularly narrow and with smooth marble; use comfortable shoes and preferably with a rubber sole. At 4:00 pm from Monday to Friday. On Saturday and Sunday, the tour of the Cathedral is at 2:15 pm and the tour of the Rooftops is at 5:00 pm.